ONE. Tarsiers are nocturnal. This means they are active only at night, hence they should be sleeping and should not be disturbed at daytime. What you should do? : Just shut up! Put yourself in their shoes and imagine yourself sleeping and somebody makes a disturbing noise. How would you feel? You don't want to get roused from sleep due to loud noise, right? If you keep on making loud noise while watching them or while scampering for that selfish selfie of yours, you just have become an accomplice to a suicide. If you insist on behaving otherwise, jump to THREE. In addition, Take photos with your flash off. They have very sensitive eyes and flashes of strong light can stress them. TWO. Tarsiers feed mainly on insects. While they are delighted over crickets, beetles, termites, and other insects, they also eat small animals like lizards, frogs, and even small birds. Will you feed them? : You are not allowed to feed them. Period. You are not allowed to impose your vegetarian diet as well [Smile!]. You, yes you! : You do not want to be an accessory to suicide, right? So, just be contented with just staring at them. You can play a staring game with the tarsier till your eyes hurt, but do not ever, ever touch them, lift them and place on your shoulders. FOUR. Tarsiers like to live alone. They are solitary and territorial animals A single tarsier needs at least a hectare of space per individual They don’t belong in a cage. 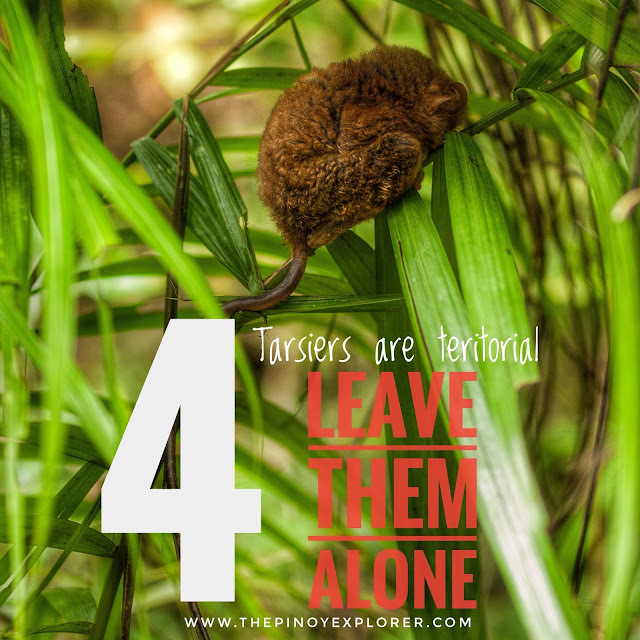 You leave them alone: Moving on is a must after an encounter with tarsiers. If you have seen it, move on. Do not linger too much. 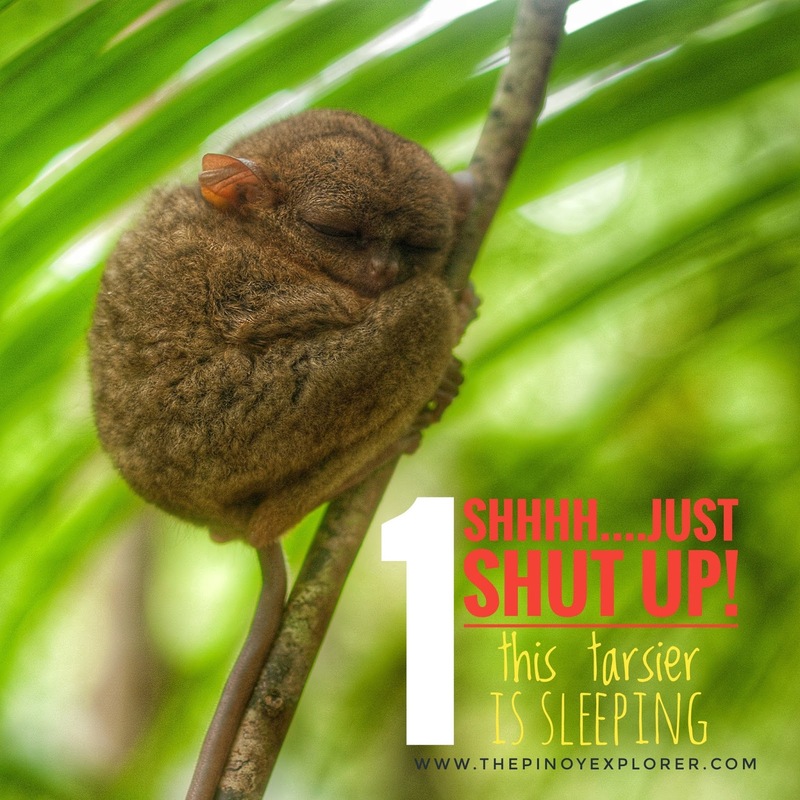 You are not only giving a rare chance for the next tourist who would love to see a tarsier but you are actually doing yourself a favor to see a cuter tarsier out there. Most importantly, though, do leave the tarsiers on their places. 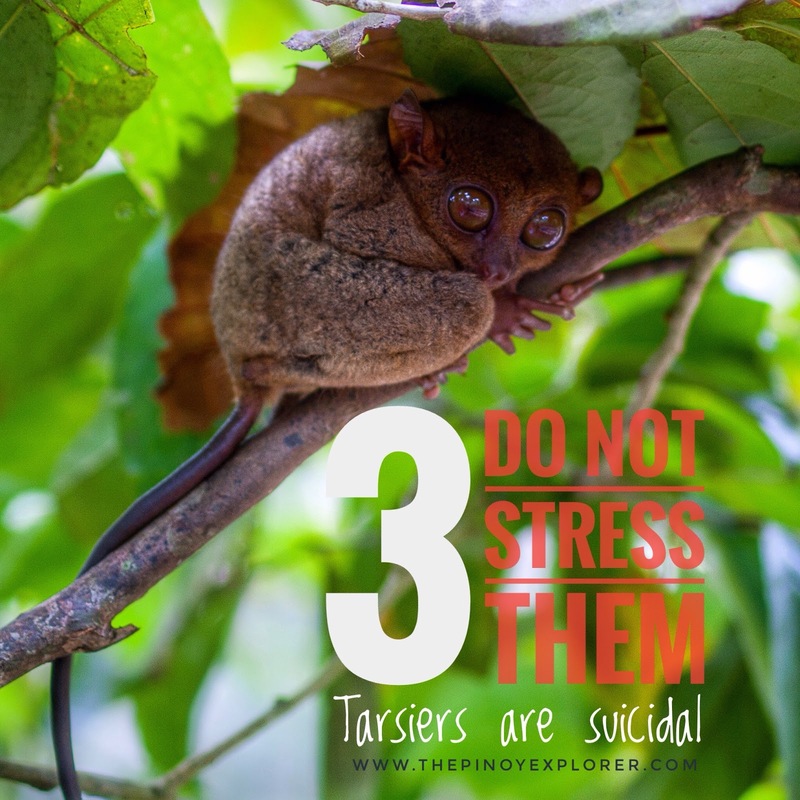 FIVE, last but most important of all, Tarsiers are a threatened species. 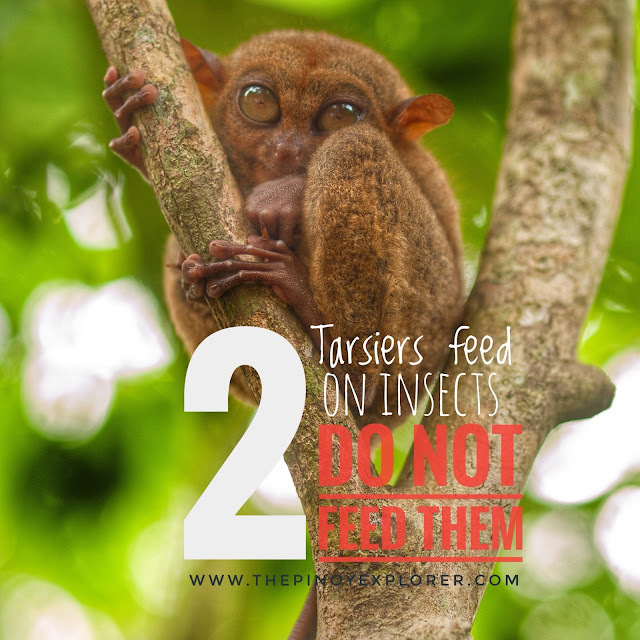 Tarsiers are not pets. They are not supposed to be captured and sold in the pet shops. They are meant to be kept in the wild or a controlled and permitted natural environment. You can be a part of a conservation efforts: You can report cases of hunting and smuggling. You can choose not to patronize pet shops and illegal tourist sites. 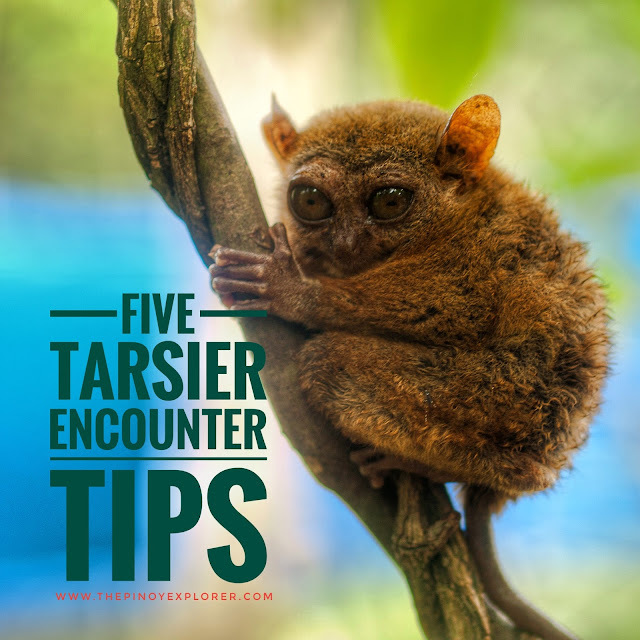 You can also donate to tarsier research and conservation. No tarsier was disturbed due to noise or held during the photography session. The author used 300mm and 50mm lenses to photograph them. No flash was ever fired. Thank you for visiting The Pinoy Explorer! You can also like The Pinoy Explorer on Facebook! 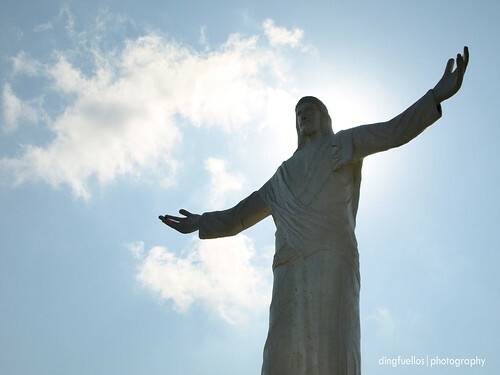 All contents of this blog, or otherwise stated, are copyrighted. For syndication, the use of articles and photos, send me an e-mail. Thank you!